If you are looking to start a patio project, then we recommend choosing a decorative concrete patio design. While a wood deck requires consistent staining and a brick patio must be maintained and guarded by intrusive weeds, a decorative concrete patio gives you the same attractive look with a more durable design. Our stamped concrete designs are inspired by other surface types, like wood, stone, and brick, but are designed to your preference. Choosing a concrete surface means you have the option to decide on the color, pattern, and texture. Take a look at some of our concrete patio designs. Our customers love that they can customize their patio surface at an affordable price. Plus, a decorative concrete patio is easy to maintain throughout the year. 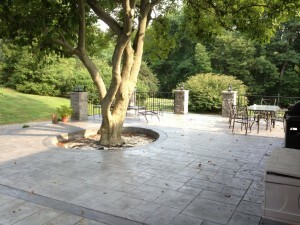 Call DiFelice Stamped Concrete today at 610-505-2065 to get a free estimate on your decorative concrete patio project.